Media Folder Compare for OS X. $5. Compare Any Two Media Folders for Differing Content. Compare the contents of any two folders located on either local, external or remote drives, with special features for media files. Quickly view the codec and sample rate info for many common media file formats. 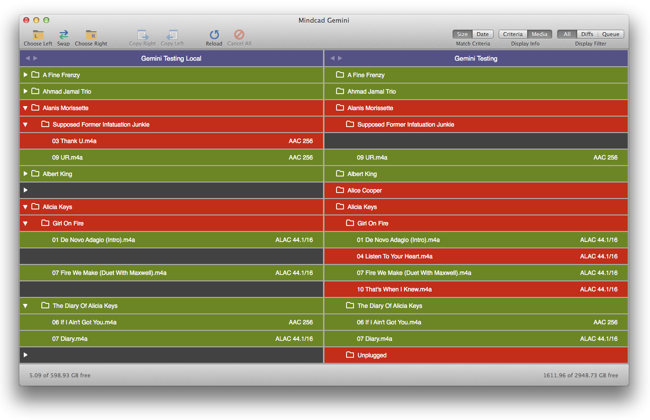 Keep the contents of multiple external media libraries in sync. Perfect for use with Sonos, Sony HAP DSD Players, and many other media file playback devices. Copyright © 2007-2016 by Mindcad LLC. All Rights Reserved.